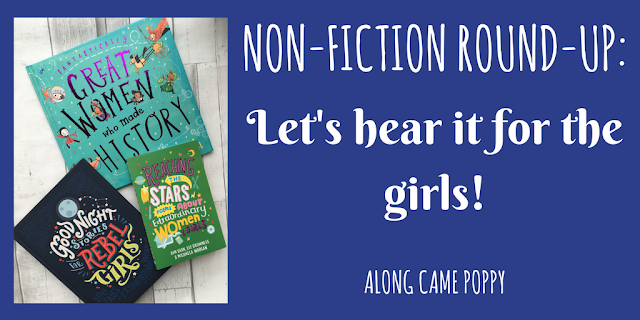 Along Came Poppy: Non-fiction round-up: Let's hear it for the girls! Non-fiction round-up: Let's hear it for the girls! At the start of the year we promised to review a non-fiction book each month and although we have been picking our favourites, we have completely neglected to write about them, so we thought it was about time for a non-fiction round-up. As you'll see there's a bit of a theme, this was purely unintentional but it works well especially as it was International Women's Day at the beginning of March, so without further delay "Let's hear it for the girls!" In January we shared our Picture Book Wish List and this book was one of the 12 new releases we could not wait to get our hands on this year! 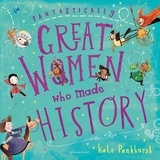 Fantastically Great Women who made History is the sequel to the brilliant Fantastically Great Women Who Changed the World. Both books have been written and illustrated by Kate Pankhurst who has an amazing talent for presenting facts coupled with quirky illustrations making them incredibly appealing to young readers. In this book we travel through time and learn about 14 women who have made their mark on history. From Cosmonaut, Valentina Tereshkova, the first woman in space to Mary Shelley, author of Frankenstein. Mini Reviewer, Izzie (6), delights at learning about all these very different yet extraordinary women. This book had been on our wish list for quite a while and I confess that the only reason I hadn't purchased it until recently was because I had a slight issue with one tiny word in the title, "for". 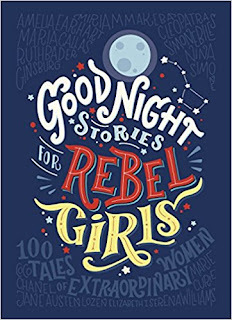 I'm strongly of the opinion that stories about heroic women should be read by boys as well as girls and I feel that the use of "for" in the title of this book will make boys feel that these stories simply aren't relevant to them, which is such a shame! Of course the title won't stop me reading the book to my son in a few years time but if that "for" had been "about" instead, I'd have been much happier! Anyway, my personal reservations aside, I was delighted when Mini Reviewer, Izzie, decided to spend her Christmas book vouchers on this particular book. Good Night Stories For Rebel Girls is described as containing 100 short stories of "heroic" women and each story is accompanied by a fabulous illustration by one of 60 female artists. Many very famous women from politicians to ballerinas are featured in the book but there are also several names that I hadn't come across before and there are certainly some that wouldn't make my list of most inspiring women! I know that I'm not alone in this opinion and you can read a great review of the book by Kim from Bookbairn here. However, what I would say is that all the women in this book have accomplished great things but they certainly haven't all followed the rules! It is a book full of grit and determination rather than perhaps perfect role models! Mini Reviewer, Izzie, has really enjoyed this book and I have loved sharing it with her and learning about such a range of talented women. Izzie's highlight was being able to read about Florence Nightingale who she had been learning about in school and her favourite illustration is of Ashley Fiolek, the pink haired Motorcross Racer! We both can't wait to see who has made it into the second book which is also available now. This empowering collection of poetry was first published in 2017 by Macmillan and is a celebration of the achievements of women and girls throughout history. It features poems about Marie Curie, Rosa Parks, Ada Lovelace and many, many more inspirational women. 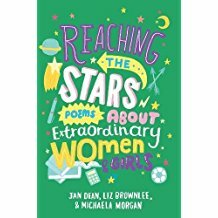 There are also poems exploring and challenging the role of women in society. I particularly like the poem Feminism Rules as it is a great way of explaining what it is to be a feminist to young readers. This book has been great to read alongside our other two choices. We hope you enjoyed our round-up and if you are interested in hearing about more books featuring strong female role models, why not join in the Little Feminist Book Club Twitter Chat hosted by Kim from Bookbairn? 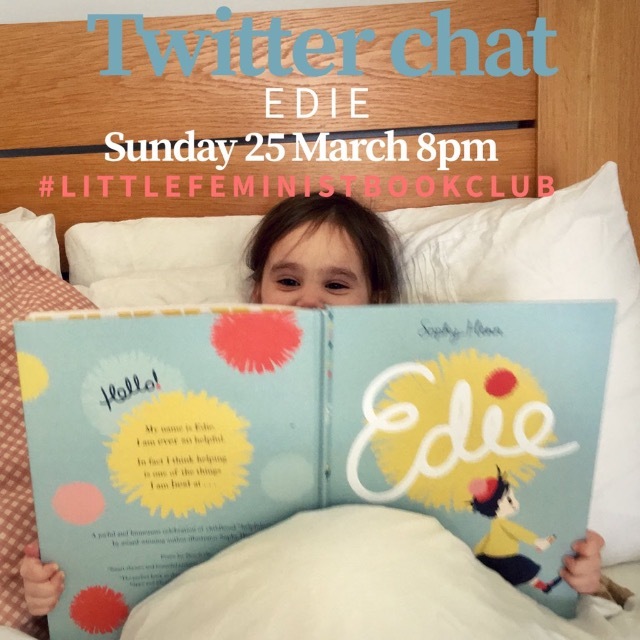 Just tweet along using #LittleFeministBookClub on Sunday 25 March at 8pm. This month the featured book is Edie by Sophy Henn. It's great that there are so many books about strong women around. My daughter is only 12, yet it feels like so much has already changed in the books that are available about female role models. I think you're so right in that books should say they're "for" anyone in particular. I would love my boys to read something like that but because it says it's for girls there's no way they'd do it.